Odori-don, which literally means “dancing squid rice bowl,” is a dish popular in the Japanese port city of Hakodate, as well as a newly-popular viral video craze. 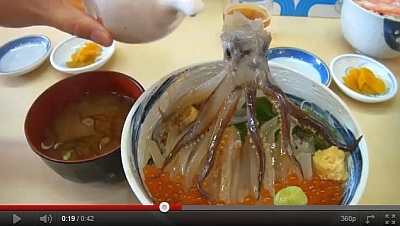 As FoodJapan.net describes the dish, Odori-don consists of a live squid with its head removed and served on top of a bowl of sushi rice, accompanied by sashimi prepared from the head, along with other seafood. Though a traditional dish for the area, the method of pouring seasoned soy sauce on top of the squid to make it “dance” prior to preparation is a relatively new phenomena made popular by the numerous YouTube videos patrons have been sharing of their recent dishes. In honor of “Video Week” here at TheExpeditioner.com, I’ve decided to put together five of my favorite — okay, frightening — Odori-don videos for your viewing pleasure. As an editor’s note, I’d recommend not watching any of these videos within two hours of eating, sleeping or operating heavy machinery. So, basically, 2:37 p.m. is the only time you should watch these. 1) This is the video that kicked off the recent craze, and will be the cause of many sleepless nights here in the Stabile household. 2) This dish’s presentation actually looks amazing, even inviting with the red complementing the earthy colors of the bed of vegetables and other seafood under the squid. Then a human gets involved and it’s all downhill from there. 3) This video just makes me sad to be a part of the human race. I’m officially becoming a vegetarian. 5) After watching only a few seconds, this one literally caused me to run and hide behind my shower curtain in my bathtub while crying helplessly.